Copyright: © 2015 Pravadali-Cekic S, et al. This is an open-access article distributed under the terms of the Creative Commons Attribution License, which permits unrestricted use, distribution, and reproduction in any medium, provided the original author and source are credited. This study investigated approaches for the profiling of coffee using two multidimensional approaches: (1) a multi-detection process and (2) a multi-separation process employing HPLC. The first approach compared multidetection techniques of conventional High Performance Liquid Chromatography (HPLC) hyphenated with a detector (DPPH•, UV-Vis and MS), and multiplexed mode via HPLC with an Active Flow Technology (AFT) column in Parallel Segmented Flow (PSF) format with DPPH• detection, UV-Vis and MS running simultaneously. 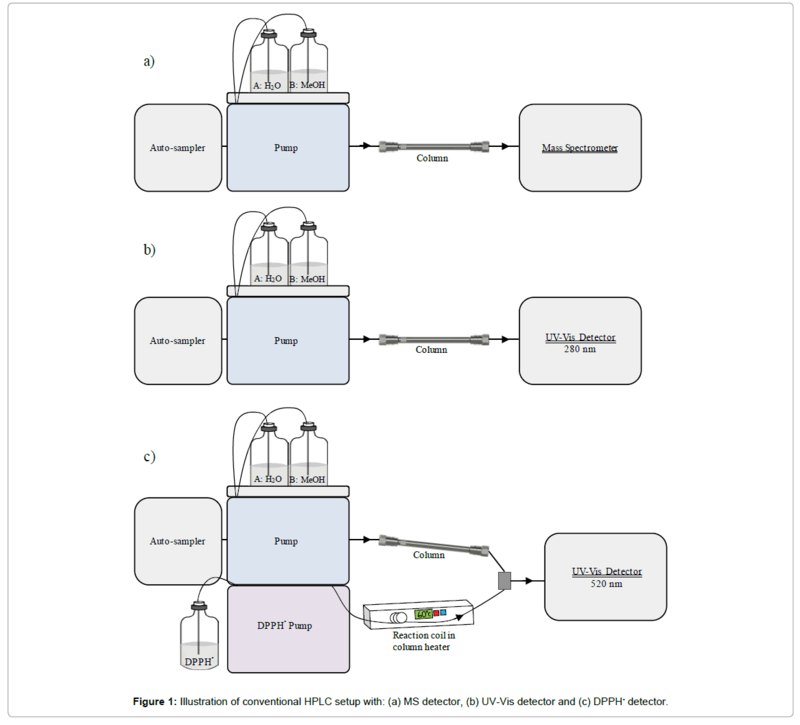 Multiplexed HPLCPSF enabled the determination of key chemical entities by reducing the data complexity of the sample whilst obtaining a greater degree of molecule-specific information within a fraction of the time it takes using conventional multi-detection processes. DPPH•, UV-Vis and MS (TIC) were multiplexed for the analysis of espresso coffee and decaffeinated espresso coffee. Up to 20 DPPH• peaks were detected for each sample, and with direct retention time peak matching, 70% of DPPH• peaks gave a UV-Vis response for the espresso coffee and 95% for the decaffeinated espresso coffee. The second approach involved the use of a two-dimensional (2D) HPLC system to expand the separation space and separation power for the analysis of coffee, focusing on the resolution and detection of coeluting and overlapping peaks, which was beyond the limits of conventional HPLC in resolving complex samples. The 2DHPLC analysis resulted with the detection of 176 peaks and a closer observation showed the presence of an additional 17 peaks in a cut section where in 1D mode only one peak was observed. Coffee, like all natural products, is complex in the nature of, and the number of compounds. It is popular for its flavour, aroma, caffeine content and antioxidant properties [1,2]. It has been reported that coffee contains hundreds of constituents [3,4] with a variety of compounds including, carbohydrates/fibre, nitrogenous compounds, lipids, minerals, acids and esters and melanoidins . The analysis and characterisation of such complex samples can be rather challenging, in particular when screening for a number of compounds and/or isolating compounds of interest, such as, antioxidants. In industries, including but not limited to food and pharma, efficient and straightforward analytical techniques are sought in order to provide significant information for sample characterisation and chemical profiling. For example, screening for antioxidant compounds in coffee is achieved with various methods of detection some of which could be classified as hyphenated methods with HPLC [5-11]. The aim of this study is the comprehensive characterisation of complex samples, especially coffee to provide a greater understanding of their nature in an efficient way. It also highlights the importance of comprehensive analyses in the identification of peaks of interest, where misidentification can occur due to degrees of uncertainty. This study focuses on multidimensional approaches to chemical profiling and characterisation of coffee in a time efficient yet comprehensive manner. From a multi-detection perspective, two detection processes are compared: The first utilises conventional HPLC coupled with a single detector, where for each detection method a sample injection is made, so that sample information is gathered through the use of a variety of detectors, including mass spectrometry (MS), 2, 2-diphenyl-1-picrylhydrazyl free radical (DPPH•) for the detection of reactive oxygen species (ROS), potentially antioxidants, and ultraviolet-visible detector (UV-Vis) as a general chromophore detection process. In the second process the detectors were multiplexed using Active Flow Technology (AFT) columns operated in Parallel Segmented Flow (PSF) mode. These AFT columns are a new column format that have been designed to provide more efficient separation utilising radial flow stream splitting to separate the radial central flow through the chromatography column from the flow near the wall . The AFT column therefore corrects for the column bed heterogeneity, a major determinant in poor separation performance . The outlet port on the AFT column contains multiple exit ports; a single radial central exit port that manages the radial central flow through the column and peripheral port(s) that manage the flow from the column wall region [12-15]. Although primarily designed to improve separation performance and the interface to MS detection , an added benefit from the design is that more than one detector can be used simultaneously, even if each detector is destructive. In fact, since the flow stream is effectively split on the column, the multiple detection process is actually multiplexed [17-19]. These AFT columns have been used in several analyses that have involved DPPH, chemiluminescence, MS, UV and fluorescence detections . The current study extends the application of multiplexed detection further, showing how DPPH•, UV-Vis and MS detectors can be used in a multiplexed arrangement with AFT (PSF) columns for chemical profiling of coffee, and in particular the search for antioxidant activity. Multidimensional HPLC is another technique that can be employed to overcome the limitations of uni-dimensional HPLC . When dealing with complex samples, the peak capacity of a unidimensional separation (separations employing just one separation step) is often exceeded because of the vast number of components in the sample. Columns simply cannot be made long enough to yield the required peak capacity and then enable the separation within a suitable timeframe . Thus, for the analysis of complex samples a move to multidimensional separation strategies is required, since the peak capacity of a two-dimensional system is equal to the product of the peak capacity of each single dimension, minus the amount of separation space lost due to correlation. A combination of multiplexed detection, and multi-dimensional HPLC would therefore form the basis of a very powerful analytical profiling tool. Mobile phase solvents were HPLC grade. Methanol was purchased from Merck (Kilsyth, VIC, Australia) and Ultrapure Milli-Q water (18.2 MΩ) was prepared in-house and filtered through a 0.2 μm filter. 2, 2-Diphenyl-1-picrylhydrazyl free radical (DPPH•) was purchased from Merck. In conventional HPLC, the DPPH• reagent (1 mgmL-1) was prepared in methanol. In multiplexed mode, 0.1% formic acid was added to the mobile phases and DPPH• reagent to cater for the mass spectral component of the multiplexed analysis. Caffeine was purchased from Sigma-Aldrich (Castle Hill, NSW, Australia). The espresso coffee (Nestlé Nespresso – Ristretto and Decaffeinated, Sydney, NSW Australia) samples were prepared fresh prior to analysis by extraction using an espresso coffee machine (Dè Longhi - Model EN 95.S), diluted fourfold with Milli-Q water, then filtered through 0.45 μm pore filter. A 0.05 mgmL-1 caffeine standard was prepared in 60:40 (water:methanol). Multiplexed chromatographic experiments were carried out using a Thermo UHPLC system coupled with TSQ Vantage mass spectrometer equipped with HESI II source (Thermo Scientific, San Jose, USA). The LC component was a Dionex Ultimate 3000 equipped with a quaternary pump, auto injector with an in-line degassing unit and RS diode array detector. The Thermo Vantage TSQ was operated as supplied from the manufacturer. Two-dimensional chromatographic experiments were undertaken on a Waters 600E Multi Solvent Delivery LC System, equipped with a Waters 717 plus auto injector, two - Waters 600E pumps, two - Waters 2487 series UV-Vis detectors (set at 280 nm) and two - Waters 600E system controllers. Separation dimensions were interfaced via a 10-port, two position switching valve that was electrically actuated. Conventional mode (Uni-dimensional mode): Separations were conducted using a 250 × 4.6 mm C18 reversed phase column (Hypersil Gold, 5 μm Pd, 175Å) from Thermo Scientific (Runcorn, Cheshire, United Kingdom). All chromatographic analyses were undertaken using gradient elution with the initial mobile phase of 100% water running to a final mobile phase of 100% methanol, at a rate of 1%min-1 then held for 20 minutes at 100% methanol. Flow-rate was set at 0.8 mLmin-1 and injection volumes were 80 μL. Mass spectrometry detection: Mass spectrometry (MS) detection was conducted using electrospray ionisation in positive ion mode. Using Full Scan detection method, Total Ion Count (TIC) analysis was carried out on the TSQ Vantage mass spectrometer equipped with HESI II source under the following conditions: Vaporiser temperature 500°C, capillary temperature, 350°C; sheath gas set at a rate of 60 unites; auxiliary gas flow 40; sweep gas flow at 5 units, and spray voltage, 1.5 kV . UV-Vis detection: UV-Vis detection was undertaken using the Ultimate 3000 RS diode array detector nominally set 280 nm. Figure 1: Illustration of conventional HPLC setup with: (a) MS detector, (b) UV-Vis detector and (c) DPPH• detector. Multiplexed detection mode using AFT columns: An AFT column in parallel segmented (PSF) mode, of the same dimensions and column packing material as the conventional column was used for multiplexed detection separations. This PSF column was equipped with four exit ports, enabling up to four separate modes of detection to be employed (Figure 2). In this study, the flow ratio through of the four detectors was set at: 18.5% of the total flow rate from the central port, which was connected to the MS detector, 22.5% of the flow from peripheral port 1 was connected to a UV-Vis detector and 59% of the flow from peripheral port 2 was connected to a DPPH• detector via a T-piece. Peripheral port 4 was not used and blocked. The chromatographic conditions of the PSF column are the same as the conditions used in ‘Conventional Mode’, and the detection mode of the MS and UV-Vis detectors was also the same as that used for the conventional mode of analysis. The DPPH• detection process was, however, slightly different, largely to compensate for the reduced flow rate eluting to that detector. Figure 2: Illustration of multiplexed HPLC setup with DPPH•, UV-Vis and MS detectors. DPPH• detection: A Shimadzu analytical HPLC system, comprising a Shimadzu LC-20ADvp quaternary pump, Shimadzu SIL- 10ADvp auto injector, Shimadzu SPD-M10Avp PDA detector and a Degassex model DG-440 inline degasser unit (Phenomenex, Lane Cove NSW Australia) was used for multiplexed DPPH• detection. Since the flow rate through the DPPH• reagent detector (peripheral port 3) was reduced, the volumetric flow of the DPPH• reagent was reduced accordingly. Specifically, the eluent stream from peripheral port 2 had a flow rate of 0.47 mLmin-1, so the DPPH• reagent was set at 0.47 mLmin-1 to maintain the 1:1, eluent stream:DPPH• reagent ratio. The combined eluent stream then entered a reaction coil (100 μL), which was maintained at a temperature of 60°C within a column heater, and then entered the Shimadzu PDA detector set at a wavelength of 520 nm to detect the radical scavenging compounds within the eluent. Figure 2 illustrates this setup. Two-dimensional HPLC: The first dimension consisted of a 100 × 4.6 mm Hypersil GOLD Cyano (CN) (5 μm Pd, 175Å) column and the second dimensional, a 100 × 4.6 mm Hypersil GOLD C18 (5 μm Pd, 175Å) column. Both columns were supplied by ThermoFisher Scientific (Runcorn, Cheshire, United Kingdom). Gradient elution was undertaken in both dimensions. In the first dimension, gradient elution began with initial mobile phase of 100% water running to a final mobile phase of 100% organic solvent (methanol), at a rate of 20%min-1 then held for 4 minutes and returned to initial conditions in 1 minute. Flowrate was set at 2.0 mL/min and injection volume was 100 μL into the first dimension. The 2D analyses of the sample was undertaken using a comprehensive incremental heart-cutting approach [8,10] involving the transfer of a 200 μL aliquot sampled from the first dimension, into the second dimension, followed by elution in the second dimension. The second dimension consisted of a C18 column, also undertaking gradient elution from 100% water to 100% organic solvent (methanol) at a rate of 20%min-1, held for 4 minutes and returned to initial conditions in 1 minute, with a flow rate of 2.0 mL min-1. This process was repeated (following reinjection of the sample) at every 0.4 minute interval across the first dimension, starting at 0.8 minutes in the first dimension, being completed after a total of 16 cuts. Both dimensions were temperature regulated at 45°C using a column heater. The multiplexed data was analysed using Origin and Microsoft Excel. The MS data was processed using LC Quan software (Thermo Fisher Scientific, San Jose, USA). The two-dimensional chromatographic data was processed using Mathematica (with home-built programs) . Two-dimensional chromatographic surface plots were produced using this software. The Ristretto coffee sample was analysed using conventional HPLC with each of the following detectors; UV-Vis, DPPH• and MS – TIC. The chromatograms from each detector are shown in Figure 3. A new sample was prepared for each analysis mode. The coffee sample showed a positive response to the DPPH• reagent, but determining which compounds having the DPPH• signal corresponded to the respective components in UV-Vis and MS chromatograms required that each chromatographic response be manually aligned– a source of potential uncertainty. 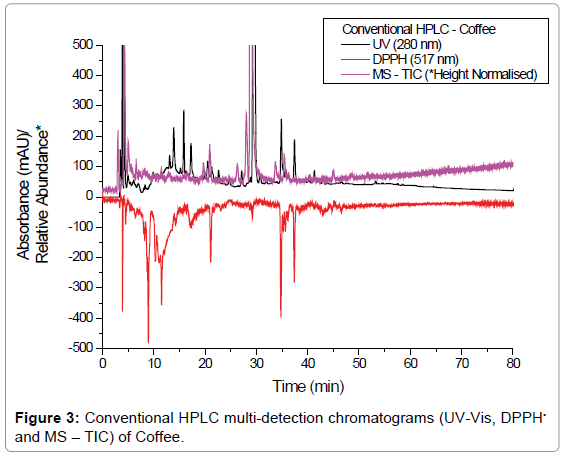 Figure 3: Conventional HPLC multi-detection chromatograms (UV-Vis, DPPH• and MS – TIC) of Coffee. 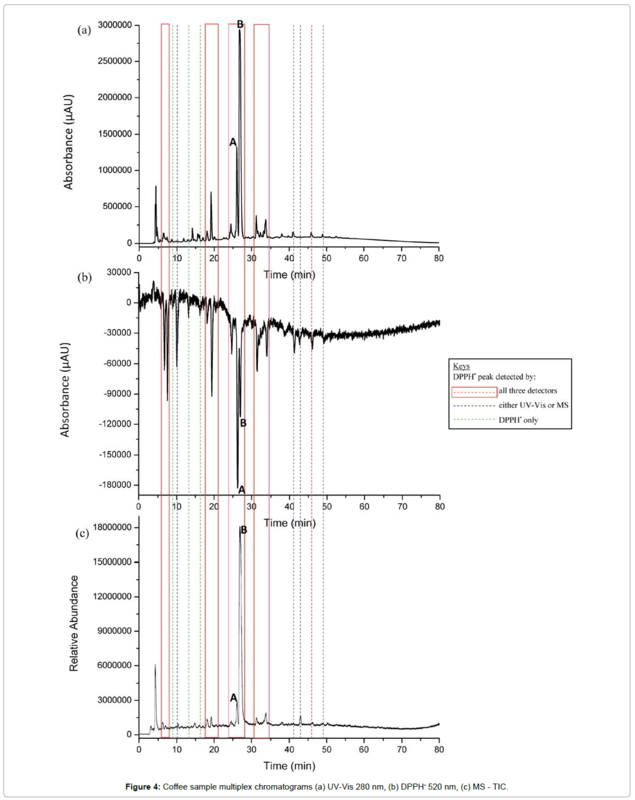 A multiplexed HPLC analysis was carried out using an AFT column in PSF mode allowing the compounds that responded to DPPH• to be easily matched up to the UV-Vis response and MS based on retention time and where a positive response was seen from the MS detector, the molecular mass of the peak was recorded. Table 1 lists the retention time of the DPPH• peaks, and the response of such peaks in the UV-Vis and/or the MS detector, which thus provided the molecular mass. Table 1: Detected DPPH• peaks response to UV-Vis and MS.
Coffee is known to have a high antioxidant content, with numerous components exhibiting response to the DPPH• reagent [5,6,17]. 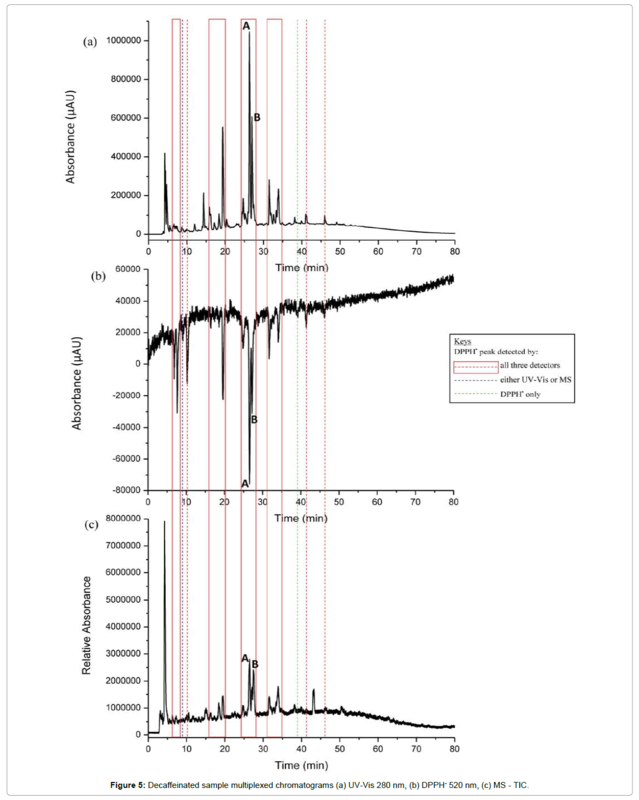 In this study, the coffee analysis with the DPPH• reagent resulted in 20 well resolved peaks, 13 of which also showed a response in the UV-Vis and MS detectors as indicated by red dotted lines across the multiplexed chromatograms in Figure 4. There were four regions that had the same chromatographic profile within each chromatogram, indicated by the red boxes. In these boxes, where UV-Vis and MS showed little response to these peaks, there was a strong response from the DPPH• detector. Four components that responded to the DPPH• reagent were not detected either by the UV-Vis or MS detectors (represented by the blue dotted lines) and three of the components that responded to the DPPH• reagent gave no UV-Vis or MS response at all (represented by the green dotted line). The molecular mass of the components that responded to the MS are recorded in Table 1. The component that eluted at the 10 minute mark according to the DPPH• assay resulted in a strong response, with no response from the UV-Vis and with a very small response from the MS detector. Figure 4: Coffee sample multiplex chromatograms (a) UV-Vis 280 nm, (b) DPPH• 520 nm, (c) MS - TIC. An interesting and reoccurring facet of the analysis of coffee with DPPH• antioxidant detection is that peak B in Figure 4 (a), which corresponds almost perfectly with the elution of caffeine shows a very strong antioxidant response. Peak A is labelled for comparison purposes. Caffeine, however, is not a reactive oxygen scavenging compound, or an antioxidant and shows no response to the DPPH• reagent when tested solely. A casual analysis of this assay may result in an analyst mistakenly assigning this antioxidant response to caffeine as the retention time is almost perfectly coincident with caffeine; rather, this antioxidant is a minor component (according to UV and MS detections) that co-elutes with caffeine. The analysis of decaffeinated coffee, for example, illustrates this interesting facet of the separation. The decaffeinated coffee sample was analysed using exactly the same methodology that was employed for the caffeinated coffee, with multiplexed detection. The resulting chromatographic responses for each of the three detectors are shown in Figure 5. In total 18 DPPH• peaks were recorded, 16 of which were also detected by the UV-Vis and MS detectors. One of the DPPH• peaks also only gave a UV-Vis response and one DPPH• peak gave no UV-Vis or MS response. Aside from a decrease in the signal intensities between the caffeinated and decaffeinated samples there was a very similar retention profile across all three detectors, except, however, the absence of the caffeine band in the UV-Vis and MS detection responses. The antioxidant responses at around the 10 minute mark in the DPPH• detector, however, still showed the presence of the two components that co-eluted with the caffeine in caffeinated coffee sample, showing clearly that caffeine was not responsible for the antioxidant behaviour, rather a co-eluting component at much lower concentration than caffeine. Figure 5: Decaffeinated sample multiplexed chromatograms (a) UV-Vis 280 nm, (b) DPPH• 520 nm, (c) MS - TIC. The chromatographic response for caffeine using UV and DPPH• detection, shown in Figure 6 further verifies this phenomenon. This nice example of sample and detection selectivity, and the confusion that co-eluting species can produce in real complex samples shows the importance of sample analysis with multiple detectors and indicates that for complete sample analysis more powerful separations are required in order to resolve more components, some of which may have important biological function. In this case, a minor component in the coffee sample with strong antioxidant activity co-eluted with the major component (caffeine). Extraction of this low concentration component from the coffee sample would therefore require better separation, perhaps multidimensional. Figure 6: Caffeine compound UV response: (a) Coffee (b) Decaffeinated coffee; Caffeine compound DPPH response: (c) Coffee (d) Decaffeinated coffee (e) Caffeine standard. In the multiplexed section of this study it was apparent that although a long separation in gradient mode was carried out on the coffee samples in uni-dimensional HPLC, there were many peaks overlapping and co-eluting due to the complex nature of the sample. The limitations of separation power and resolution of uni-dimensional HPLC for complex samples are well known . The separation power and resolution of a uni-dimensional system is impractical for complex samples, essentially due to the insufficient peak capacity [20,24-27] and the need for more time efficient techniques. Thus, for the analysis of complex samples a move to multidimensional separation strategies is required, ergo a two-dimensional (2D) HPLC separation was carried out on the Ristretto Espresso coffee sample. Based on a previous study by Mnatsakanyan et al. a 2DHPLC system containing a Cyano (CN) phase in the first dimension and a octadecyl (C18) phase in the second dimension with a water:methanol solvent system, under gradient conditions, gave highly orthogonal retention behaviour for the analysis of the same coffee sample. For this reason, this system of selectivity was chosen. Initially, a uni-dimensional (1D) HPLC separation using the CN column was carried out for the coffee sample and is illustrated in Figure 7. The chromatogram shows bimodal distribution of coffee peaks, however, many peaks co-elute as a result the saturation of the separation space. Figure 7: Uni-dimensional separation of Coffee on Cyano phase under gradient conditions of 20%min-1 gradient, from 100% water to 100% methanol at 2 mLmin-1, held for 4 minutes and returned to initial conditions in 1 minute (yellow circle indicates caffeine peak). 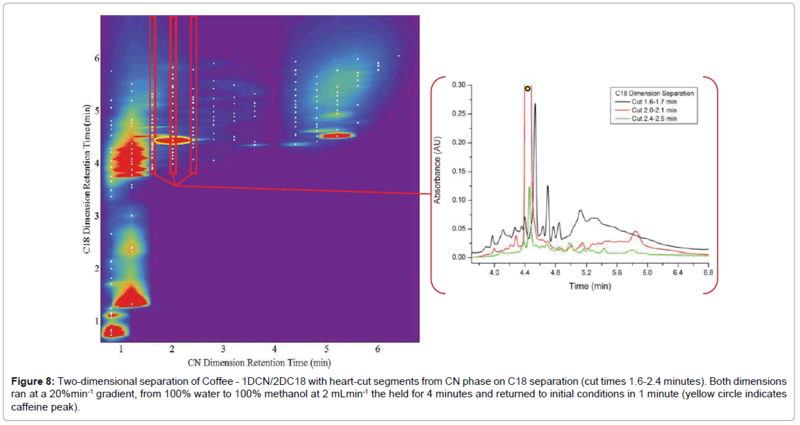 The coffee sample was then analysed using 2DHPLC in a comprehensive heart-cutting approach where at every 0.4 minutes, a 200 μL aliquot from the first dimension was transferred into the second dimension for further separation. In total, 176 peaks were identified (compounds that responded to the UV set at 280 nm). Figure 8 illustrates the two-dimensional surface plot of the coffee sample. The identified peaks are represented by the white dots and the second dimension separation chromatograms of 3 cut times (1.6, 2.0 and 2.4 minutes) are also shown. It is evident that under 1DHPLC many peaks were co-eluting and by expanding the separation space through the use of a 2DHPLC many underlying peaks were resolved. For example, in the 1D chromatogram (Figure 7) only a single peak - caffeine (indicated by the yellow circle) can be seen at around the 2.0-2.1 minute mark, however, when a 200 μL aliquot cut from this region was transferred to the second dimension for further separation an additional 17 peaks were resolved from under this band. This example illustrates the power of 2DHPLC compared to 1DHPLC for the analysis of complex samples, such as coffee. Through the use of different selectivity conditions the separation power and efficiency can be increased to enable more detailed sample characterisation. Clues to the presence of multiple coeluting species were, in the first instance, provided by the multiplexed detection process. Hence demonstrating the synergistic benefits of the multidimensional/multi-detection process for comprehensive sample analysis. Figure 8: Two-dimensional separation of Coffee - 1DCN/2DC18 with heart-cut segments from CN phase on C18 separation (cut times 1.6-2.4 minutes). Both dimensions ran at a 20%min-1 gradient, from 100% water to 100% methanol at 2 mLmin-1 the held for 4 minutes and returned to initial conditions in 1 minute (yellow circle indicates caffeine peak). The characterisation and profiling of coffee was achieved using two multidimensional approaches: (1) using multi-detection processes, in particular using a new column technology that enable multiplexed detection, (2) multidimensional HPLC, which utilised two separation steps coupled in time. The first approach involved the detection selectivity for antioxidants via DPPH• detection, chromophore functionality through UV-Vis and information for molecular mass by MS. The coffee characterisation through detection selectivity was initially carried out in conventional mode, where for each detector a sample injection was made followed by the HPLC separation then detection. A significant amount of information was derived about compound functionalities of the sample. However, this process was time consuming and required greater amount of sample. Multiple detectors could be used in a series to reduce lengthy run-times whilst only requiring one sample injection, however, this would lead to band broadening, which can be substantial and diminish the HPLC efficiency. Furthermore, only one destructive detector can be used in any single detector series, in this study two of the detectors were destructive. The coupling of an AFT column in PSF mode gave the opportunity to run multiple detectors in multiplexed mode, where all detectors regardless of HPLC-detector requirements were run simultaneously in a single injection and separation of sample. Multiplexed detection with AFT columns provided a large amount of sample information, three detectors operated simultaneously within the run time of one injection and allowed for the exact match of retention time of peaks within each detection mode. Also, two of these detectors were destructive detectors. A follow up study would involve the coupling of 2DHPLC with AFT columns in multiplexed mode that encompasses the separation power of a multidimensional HPLC system as well as the versatility and efficiency of multiplexed detection, resulting in a comprehensive characterisation and profiling of a sample with 2DHPLC efficiency. Robards K (2003) Strategies for the determination of bioactive phenols in plants, fruit and vegetables.J Chromatogr A 1000: 657-691. Leo ML Nollet, ToldraF (2012) Food Analysis by HPLC, CRC Press, Taylor and Francis, Boca Raton, Florida. Farah A (2012) Coffee, Wiley-Blackwell, pp: 21. Clarke RJ, Macrae R (1985) Coffee: Chemistry, Springer, Netherlands. Camenzuli M, Ritchie HJ, Dennis GR, Shalliker RA (2013) Reaction flow chromatography for rapid post column derivatisations: the analysis of antioxidants in natural products. J Chromatogr A 1303: 62-65. Mnatsakanyan M, Goodie TA, Conlan XA, Francis PS, McDermott GP, et al. (2010) High performance liquid chromatography with two simultaneous on-line antioxidant assays: Evaluation and comparison of espresso coffees.Talanta 81: 837-842. Mnatsakanyan M, Stevenson PG, Shock D, Conlan XA, Goodie TA (2010) The assessment of pi-pi selective stationary phases for two-dimensional HPLC analysis of foods: application to the analysis of coffee. Talanta 82: 1349-1357. 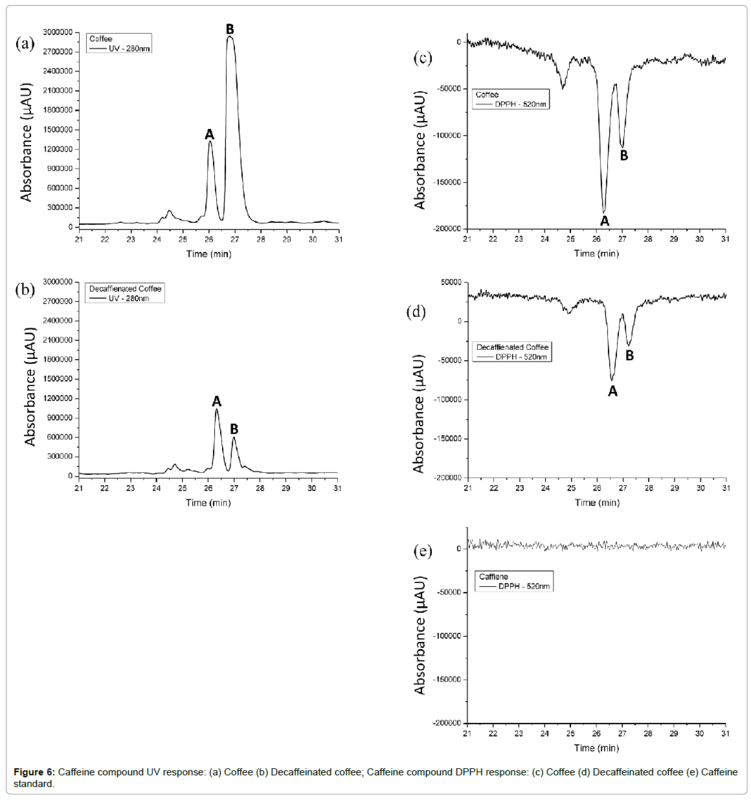 Mnatsakanyan M, Stevenson PG, Conlan XA, Francis PS, Goodie TA (2010) The analysis of café espresso using two-dimensional reversed phase–reversed phase high performance liquid chromatography with UV-absorbance and chemiluminescence detection. Talanta 82: 1358-1363. Richelle M, Tavazzi I, Offord E (2001) Comparison of the antioxidant activity of commonly consumed polyphenolic beverages (coffee, cocoa, and tea) prepared per cup serving.J Agric Food Chem 49: 3438-3442. Stevenson PG, Mnatsakanyan M, Francis AR, Shalliker RA (2010) A discussion on the process of defining 2-D separation selectivity.J Sep Sci 33: 1405-1413. McDermott GP, Conlan XA, Noonan LK, Costin JW, Mnatsakanyan M (2011)Screening for antioxidants in complex matrices using high performance liquid chromatography with acidic potassium permanganate chemiluminescence detection. AnalChimActa 684:134-141. Camenzuli M, Ritchie HJ, Ladine JR, Shalliker RA (2011) The design of a new concept chromatography column.Analyst 136: 5127-5130. Shalliker RA, Ritchie H (2014) Segmented flow and curtain flow chromatography: overcoming the wall effect and heterogeneous bed structures.J Chromatogr A 1335: 122-135. Camenzuli M, Ritchie HJ, Shalliker RA (2013)Improving HPLC separation performance using parallel segmented flow chromatography. Microchem J 111: 3-7. Shalliker RA, Camenzuli M, Pereira L, Ritchie HJ (2012) Parallel segmented flow chromatography columns: conventional analytical scale column formats presenting as a 'virtual' narrow bore column.J Chromatogr A 1262: 64-69. Camenzuli M, Goodie TA, Bassanese DN, Francis PS, Barnett NW, et al. (2012) The use of parallel segmented outlet flow columns for enhanced mass spectral sensitivity at high chromatographic flow rates.Rapid Commun Mass Spectrom 26: 943-949. Camenzuli M, Ritchie HJ, Dennis GR, Shalliker RA (2013) Parallel segmented flow chromatography columns with multiplexed detection: An illustration using antioxidant screening of natural products.Microchem J 110: 726-730. Camenzuli M, Ritchie HJ, Shalliker RA (2013)Evaluating active flow technology HPLC columns as a platform for multiplexed detection. Microchem J 110: 473-479. Camenzuli M, Terry JM, Shalliker RA, Conlan XA, Barnett NW (2013)Parallel segmented outlet flow high performance liquid chromatography with multiplexed detection. AnalChimActa 803: 154-159. Guiochon G (2006) The limits of the separation power of unidimensional column liquid chromatography.J Chromatogr A 1126: 6-49. Kocic D, Pereira L, Foley D, Edge T, Mosely JA, et al. (2013) High through-put and highly sensitive liquid chromatography-tandem mass spectrometry separations of essential amino acids using active flow technology chromatography columns.J Chromatogr A 1305: 102-108. Stevenson PG, Mnatsakanyan M, Guiochon G, Shalliker RA (2010) Peak picking and the assessment of separation performance in two-dimensional high performance liquid chromatography.Analyst 135: 1541-1550. Felinger A (1998) Data Anlaysis and Signal Processing in Chromatography, Elsevier Science B.V, Netherlands, pp: 331-413. Dugo P, Cacciola F, Kumm T, Dugo G, Mondello L (2008) Comprehensive multidimensional liquid chromatography: theory and applications.J Chromatogr A 1184: 353-368. Gray MJ, Dennis GR, Slonecker PJ, Shalliker RA (2004) J Chromatogr A 1041:101-110. Stoll DR, Li X, Wang X, Carr PW, Porter SE, et al. (2007) Fast, comprehensive two-dimensional liquid chromatography.J Chromatogr A 1168: 3-43. Toups EP, Gray MJ, Dennis GR, Reddy N, Wilson MA, et al. (2006) Multidimensional liquid chromatography for sample characterisation.J Sep Sci 29: 481-491.